Making Windows Phone more accessible was one of the goals Nokia set out to achieve when the deal with Microsoft was sealed. Well, it took the Finns only five months after the release of their first Microsoft-powered smartphones, to come up with the Lumia 610, which is ready to challenge the Windows Phone definition of affordable. Considering that the Nokia Lumia 610 is a first attempt, and essentially a conscious downgrade, the end result is pretty solid. The smartphone behaves way smoother than its spec sheet suggests. Sure, heavy apps like Nokia Drive take a while to load but the overall speed and response are good. Surprisingly good, to be fair. That leaves the issue of app incompatibility due to insufficient RAM. No two ways about it, not having Skype is bad but, with some developers already busy accommodating the lower specs, Microsoft are not likely to leave their own service out for long. The free lifetime voice-guided navigation on the other hand is probably worth a huge chunck of the price tag on its own and the build quality is better than what we are used to seeing in this class. A screen of this size and resolution is also hard to come by in the sub-€200 bracket and it's another point in the Lumia 610's favor. However, there's no denying the fact that Windows Phone ecosystem is still catching up with Android (even if the Lumia 610 competitors are all still running Gingerbread) in terms of both features and choice of apps. The droid rivals have the luxury too of choosing from a number of chipsets, some of which are powerful enough to handle the more demanding OS. That makes WP increasingly hard to recommend. But let's not get ahead of ourselves and take a look at what smartphones are out there to threaten the Lumia 610. We'll begin with some in-house competition. The Lumia 710 has been out for a while and its price is currently quite close to that of the Lumia 610 - even lower in some markets. It offers a faster processor, more RAM, meaning you'll be getting the full WP experience (apps or otherwise). It has a superior camera to boot, with decent 720p video recording. The Samsung Omnia W is only slightly more expensive than the Lumia 610 but it has some clear advantages. The front is dominated by a beautiful SuperAMOLED display. The back features a fine 5 MP camera, and there's a more powerful processor inside making the whole UI feel much smoother. A short stroll over to Android takes us to a likable little smartphone by Sony. The Xperia U is not only the most affordable dual-core smartphone, but it's also offering a Bravia-powered display of slightly better resolution and a flashy transparent strip that changes color to match the screen contents. Even more impressively, the Xperia U costs about the same as the Lumia 610, and might turn out to be the one to beat. And just like in most other price brackets we have an alternative by Samsung. The Ace 2 is basically offering the same package as the Xperia U, but solves the memory issue with a microSD card slot and adds a slightly larger screen. It does cost about €40 extra though, and that's a significant difference here. The truth is the Nokia Lumia 610 is currently slightly overpriced. We did say that it's all about what you get and not what you miss in this class but, as things currently stand, its competitors will give you more without extra charge. It sounds like common sense that the only way for an affordable WP smartphone to succeed is to be cheaper than its droid peers. On the other hand, the Lumia 610 looks like the right phone for Nokia. An entry level smartphone could do well for them in traditionally loyal markets. 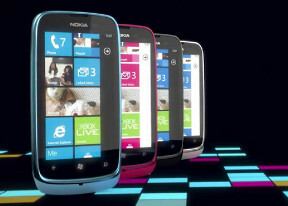 This affordable option may also be an awareness raiser in the buildup to Windows Phone 8. Would you call it common sense too that if they got Windows Phone 7 to run on an 800MHz chip and 256MB of RAM, they might as well find a way to put Apollo on the current single-core smartphones? It seems the Lumia 610 gives loyal Windows Phone users something to look forward to. And we don't just mean a price drop. Although one can really do wonders for the prospects of what is otherwise a pretty good smartphone for first-time users.